Combined Driving is a test of obedience, endurance, skill, and agility. It is somewhat like eventing, with driven dressage, an obstacle course, and a marathon phase. 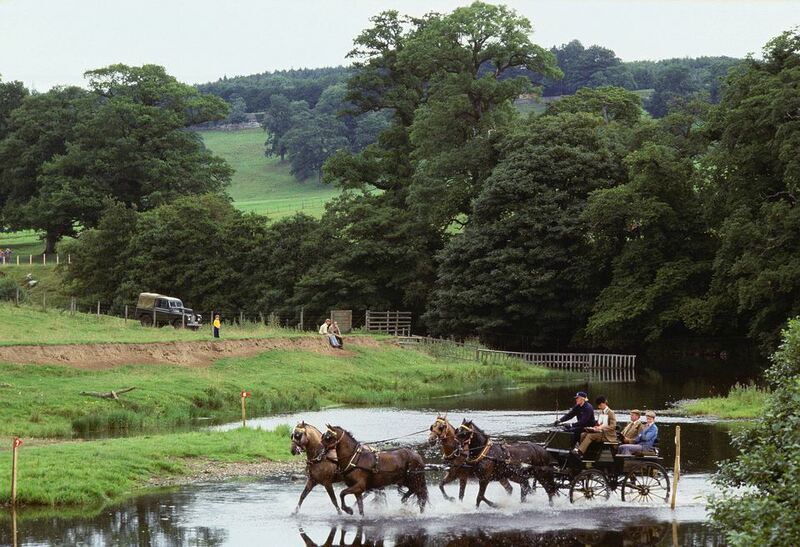 Single horses, pairs or teams pull vehicles through the required elements. Competitors perform prescribed tests much like a dressage test. The obstacle phase requires the driver to negotiate a series of pylons with a ball perched on top without knocking them down. Marathon competitors negotiate obstacles like bridges, streams, hills, and labyrinths. The course may be up to 11 miles (18km), although at the lower levels the distance and pace will be lower. In the dressage phase, judges look for accuracy, clean transitions, energetic gaits, square halts, suppleness, obedience, and presentation. The cone course is timed and points are lost for every obstacle knocked down. Points are lost for disobedience, poor turn-out, unauthorized assistance, or exceeding the time limit. The marathon is judged on the time it takes to complete the course with as few penalties as possible. Penalties can be incurred for going off course, overturns, problems with harness or vehicle, breaking pace during the compulsory walk, or grooms or whip dismounting from the vehicle during the course. A well-trained horse or pony. Even Miniature Horses are used in CDE. Quality harness for each of the horses/ponies you'll be competing with. A well-built carriage(four-wheeled horse-drawn vehicle) or cart. A groom who can help navigate during the marathon phase and balance the carriage throughout. helmet for the whip (driver) and groom. Torso protectors for whip and grooms is a good idea. Suitable clothing. For example, if your vehicle is 'western style' you would wear appropriate western style clothing. Always check the rules of the event hosts for more details. Before competing you will be able to walk the courses. Your harness and vehicle will be checked for safety and your presentation may be judged. Your start time will be determined by a draw. You will also be given minimum times to finish without penalty. Your horse may be checked for fitness by a vet team. Your groom can help keep you on course and on time. The dressage test will be made available to you ahead of time. Observers positioned throughout the marathon course report any incidents to the judges. The ideal score is zero, meaning no penalties or time faults. In case of a tie, a drive-off is held. Fitness, obedience, and agility are key in Combined Driving Events not only to compete successfully but safely. A tired or disobedient horse can mean obstacles are negotiated poorly, resulting in penalties or accidents. If you are driving most days of the week, practicing elements of all phases of Combined Driving your horse will likely be fit for the lowest levels. You may want to add in conditioning over the same sort of distance and terrain you will be facing. Start slowly, building up speed and distance over time. Your horse must be controllable in open areas and confident through obstacles. Combined Driving Events require dedication and are not something you want to try without prior preparation. Training with an experienced coach will help you learn pacing and how to safely negotiate all phases safely and successfully. Familiarize yourself with the rule book. Those who may not wish to ride, for any reason may find driving and the challenge and excitement of combined driving events appealing. The sport is accessible to all horse and pony breeds and all ages and abilities of drivers and grooms. Riding horses benefit from the training and conditioning. Weather rarely is a problem as there are indoor events. Combined Driving Events are a lot of fun for spectators too.